2011 April Archive « .Evolving Music.
. Closed Tags: Ace of Spades, Adam Taylor, Audies Olympic, Black Uhuru, California, Calpoly San Luis Obispo, FanBridge, Fantourage, Fresh Grounds, Hawaii, Iration, Isla Vista, iTunes, Kelly Slater, Kona Homestead Coffee, MobBase, Northern Arizona University, Phoenix Theater, pop, Rebelution, reggae, rock, Santa Barbara, Senator Theater, SLO, Southern California, The Avalon, The Beatles, The Police, UCSB. Iration is a Southern Californian based band that formed in 2006 when the members attended UCSB. All coming from Hawaii, the band has created a powerful sound that fuses reggae, rock and pop. They released their “Fresh Grounds” EP in February and have been touring all year, most recently as part of the Winter Greens Tour with Rebelution. I had a chance to sit down with Iration’s bassist, Adam Taylor, and ask him about how Iration came to be, their influences, marketing strategies and their next tour. TC: You guys are all from Hawaii but met in Isla Vista, California. How did Iration form? AT: Iration formed while we attended UCSB. It started as a hobby and then developed into our career. TC: Do you pull a majority of your influence from Hawaii or where you live currently? How is that influence brought out in your music? AT: Initially from Hawaii, but these days I feel like we’re influenced by our surroundings here in Santa Barbara and while on tour. It comes out in the way we approach creating songs and the way we perform live. TC: You released your “Fresh Grounds” EP in February and are setting out on tour. What are you looking at to accomplish with this next tour? How will this tour be different than other tours you have been on? AT: We want to bring out all our fans as well as gain some new ones. We want to play well and give the audience a really fun and memorable experience. We’ll be playing new material off our new CD as well as two covers that are really fun to play. We’ll also be experimenting with some acoustic stuff on this tour. TC: Who would your dream tour lineup consist of? AT: The Police, The Beatles, Black Uhuru, and Iration! TC: You guys have played at many colleges, especially in California. Which college town has given you the best fan response? Why did you choose to play colleges as opposed to regular venues? AT: Calpoly in San Luis Obispo is great and so is Northern Arizona University. We play colleges because you typically get a large built-in crowd and often times students that have never heard of you get exposed to your music. TC: What is one of the craziest things you have had happen on tour? AT: My amp had a power overload and caught on fire on the past tour. That was pretty crazy! TC: What is your best fan memory? AT: Hanging out with Kelly Slater on stage! TC: Your band’s website is set up like a blog on the homepage. Did you design it this way in order to connect more with your fans? AT: Yes. Social networking and having a strong viral presence is really important to us and it’s a great way to connect with fans. TC: What are some of your favorite ways to reach out to your fanbase? AT: We like using Fantourage and Fanbridge. Fans can ask us questions and post videos and photos from the shows. TC: Do you have an online marketing strategy in place? AT: We basically like to keep up a strong presence online and be in constant communication with our fans. It just comes down to us enjoying what we do, and we love to write back to fans and hear what they have to say online. TC: How does your MobBase mobile app fit in to this strategy? What has the response been from fans? AT: Fans love it. Its a great tool for finding out where a show is or listening to music. Its free on iTunes and the Android Market, so pick it up! TC: If Iration owned a coffee company, what would be the name of your special blend and most popular pastry? AT: Our drummer does own a coffee company on the big island of Hawaii, called Kona Homestead Coffee! If the others owned one, we’d call our special blend ‘Kona Gold’ and our pastry would be the Butternut. April 30th at Audies Olympic in Fresno, CA. May 12th at the Ace of Spades in Sacramento, CA. May 13th at the Senator Theater in Chico, CA.
. Closed Tags: Animals In Bloom, Bay Area, Big Light, Brooklyn Bowl, Facebook, Fred Torphy, High Sierra Music Festival, iphone, iPhone Apps, Marco Benevento, MobBase, Nathan Moore, Noisepop, Outside Lands, Rhode Island, rock, RockBand, San Francisco, SXSW, The Dun Four, The Independent, The Mother Hips, The Slip, Tom Waits, Xbox. Big Light is a San Francisco based rock band that emerged onto the scene in 2007. They are now considered one of the Bay Area’s hottest up and coming bands and released their debut full length album, Animals in Bloom, in March 2010. I had a chance to sit down and talk with Fred Torphy, the lead singer of Big Light, about their album, where they have gone since, and how they are using technology to connect with their fans. TC: Big Light seems to pull its sound from a variety of sources. What are your major musical influences? TC: Do you pull a lot of influence from San Francisco, where you live now, or Rhode Island, where you grew up? FT: I’m influenced by everything that happens in my life, so I’ve probably picked something up from every place I’ve ever spent a good bit of time in. San Francisco, Rhode Island… Sure, but I would also need to add a few other places to that list. I lived in Burlington, VT for six years studying archeology and then getting back to playing in bands, something I had done since grade school but put down during college, for the most part. I started writing my first songs in Burlington. “Monster”, which is on Animals In Bloom, was something I started writing in Vermont. TC: You guys have played in a variety of venues in San Francisco. Which venue has been your favorite to perform in and why? FT: The Independent in San Francisco – hands down the coolest place to play in SF, staffed by some of the nicest people working in music. It’s our hometown gig. TC: In which one have you gotten the best crowd response so far? FT: Putting the Independent in SF aside, The Brooklyn Bowl in NYC is an amazing venue that always has a great audience. TC: “Triceratops” was recently made available for Rock Band on XboX. What caused you to sign this deal with Rock Band? FT: We like the idea of people from different scenes learning about Big Light through a game… I think it’s cool to infiltrate a whole world that was completely alien to me until recently. It’s not like we’re background music for a video game. People playing “Triceratops” on Rock Band are interacting with our music in a really interesting way. TC: Were there incentives for this? FT: The exposure it offers is certainly an incentive. There isn’t a huge check coming to us from Rock Band or anything like that. You can buy our song for a buck. TC: How did the majority of your fan base react to this? FT: As always, they are supportive. FT: Well, “selling out” usually involves making a bunch of money, so no it hasn’t come up. TC: Being one of the up-and-coming bands in the Bay Area, where are you hoping that your album “Animals in Bloom” will take you? TC: Big Light has played a variety of music festivals such as: Noisepop, SXSW and Outside Lands. Which festival has been your favorite to play? FT: High Sierra Music Festival in Quincy, CA is my favorite festival, hands down. I’ve been six years in a row, and Big Light has played the last three years. I met my girlfriend there. I’ll always show up for that one, as long as they will have us. TC: Is fan connection easier at a festival or at a normal show? FT: Sure. Everybody shares their drugs. TC: Have you shared the stage with any artists you have looked up to? FT: Yes. The guys in The Mother Hips, Marco Benevento, The Slip, Nathan Moore – we’re lucky to have worked with all of them. Nathan, in particular, is someone who I’m extremely honored to be working with on a semi-regular basis. I learned how to sing and write through studying his music. Now we collaborate and write the occasional song together and started a band called The Dun Four. TC: You guys are really active in online and mobile marketing – what does your digital marketing strategy consist of? Can you comment on any initiatives that went really well? FT: It’s how people live their lives now. Facebook is an important tool for every band, I suppose. It also just brought down a 30-year-old dictatorship in Egypt. It’s ubiquitous. FT: Well, those fans that have an iPhone find the MobBase app helpful for keeping up on what’s happening with us. I get a kick out of all the technology that we employ to do business. It’s a lot different from when I was in high school, putting up posters and using word-of-mouth, literally. The internet had no role in my life back then… These days every band needs the web to exist. TC: If Big Light was a superhero, what power would he possess and what would his costume look like? FT: He’d be able to stay up for days in a row playing music. His costume would be all black, naturally. Big Light’s next show will be at Slims on 4/20/11 for $13. MobBase Apps Now Available for Android!
. Closed Tags: Adobe AIR, AIR Apps, Android Apps, AppUp, Charles Feinn, Eric Wittman, InMarket, Intel, iPhone Apps, mixmatchmusic, MobBase, MobBase AIR Apps, MobBase Android Apps. MobBase, the fast, easy and inexpensive way for musicians to make iPhone apps, is now the fast, easy and inexpensive way for them to get Android apps too. Musicians and music companies can now use MobBase to build their own custom applications and with no extra effort, offer them to fans using Android devices and even personal computers. The build-once, publish across multiple platforms capability is made possible through Adobe InMarket, a service that helps MobBase distribute Adobe® AIR® applications across app stores, including the Intel® AppUp℠ storefront. MobBase has already launched hundreds of Android and desktop apps and is offering artists the additional distribution on Android and desktops for no additional monthly cost through this summer. The current AIR application will run on Android OS 2.2 or later equipped phones, and on personal computers running AIR. MobBase apps are expected to be published on additional mobile devices, tablets, and TVs in the future. Adobe AIR, a key component of the Adobe® Flash® Platform, is a cross-platform environment that makes it easy to build and deploy rich Internet applications on multiple platforms. 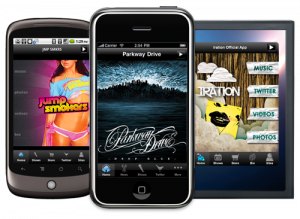 More than 400 artists, record labels and concert venues have launched their own MobBase apps, including Tila Tequila, X Japan, Parkway Drive, Pepper, 9:30 Club, and Paul Thorn. And producers for shows and movies including Parenthood and Stomp the Yard are using MobBase to connect with fans. MobBase distribution partners including IODA, Jango, IRIS, BandsInTown, HelloMusic and Valleyarm will be offering MobBase Android and desktop apps to their artists and labels.
. 17 Comments Tags: Apple, iTunes, iTunes Developer Account, MobBase, New iPhone App Submission Policy. Apple has notified us they are now requiring a unique iTunes Developer Account for each new app submitted to the App Store. The change in policy means that build-your-own-app companies, including MobBase, can no longer submit apps to the App Store under a master iTunes Developer Account. This has an immediate impact on apps currently in the approval queue, which will have to be resubmitted under a new iTunes Developer Account. We’ve communicated details to affected customers and offered to refund their set up fees, as well as a generous discount on iPhone activation fees going forward. Apple tells us that apps already approved and live in the App Store are unaffected. Apple’s change in policy means it will take more time, more effort and more money to get an iOS app, regardless of whether artists work with MobBase, make your own iPhone app company or a custom developer. We can’t do anything about the $99 a year Apple requires for each iOS Developer Account. However, we’re absorbing a big part of the extra cost and work involved in getting an app ready to be approved under the new Apple process. While this is not great news for anybody, we’re doing our best to help artists navigate the changes in Apple’s policy and still provide a great way for them to build their own iPhone/iOS apps. Artists still need a mobile app to connect with fans and help build their careers. And MobBase remains the easiest and least expensive way to get one that looks great and has all the functionality you need. And soon we’ll be announcing some more options: Android and Desktop apps are not affected by Apple’s policy change, so you will be able to get a great app for your Android and Desktop using fans at a ridiculously low price. And we’ll have a mobile web app soon too. As always, we welcome your suggestions and ideas below.